Day temperatures 15/19°C, around 1000m 1°C. A single-seat chair lift takes visitors under the summit of Javorový (1013 m above sea level) near Třinec. Refreshments are available at the Javorový chalet. The summit is a good starting point for hiking tours. by car: from road no. E75 (Český Těšín-Třinec-Jablunkov-Mosty u Jablunkova) in Třinec turn for Oldřichovice (follow signs to "Lanová dráha Javorový"). by bus: from Třinec railway station or bus station, to the bus stop "Oldřichovice, u lanovky"
A four-seat chair lift from the "Dedovka" sports centre up to the ridge of Velká Rača. Refreshments, a summer sled run and other attractions available. A hiking tour leads from the upper chair lift station to the summit of Velká Rača, 1236 m above sea level, (approx. 1 hour), where there is a border crossing ( Slovakia - Poland ) for walkers. There is a chalet offering refreshments on the Polish side of the border. by car: by road no. E75 (Český Těšín-Třinec-Jablunkov-Mosty u Jablunkova -border crossing CZ/SK-Čadca). After passing through the town of Čadca, you will reach the village Oščadnica; turn left to the centre of the village and follow signs to the "Dedovka" sports centre. A two-seat chair lift from Wisla - the hamlet of Labajow, leads under the summit of Velký Stožek (978 m above sea level). 5 minutes from the upper chair lift station there is the Wielki Stożek chalet. Poland-Czech Republic border crossing. Good starting point for hiking tours. 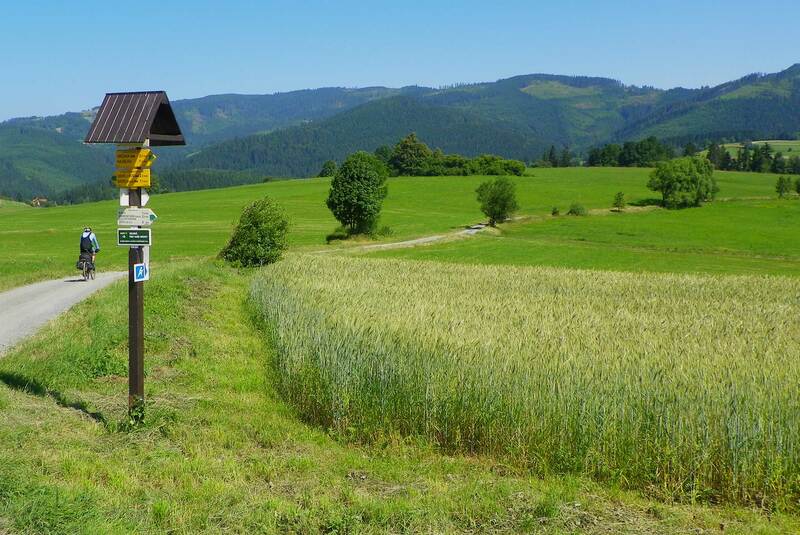 by car: from Jablunkov over border crossing Bukovec/Jasnowice continue through Istebna, Kubalonka gap to Wisla. At the beginning of the town of Wisla (Wisla-Glebce) turn left towards Labajow. At the upper station there is a summer sled run and refreshments available. At the summit of Velká Čantoryje (approx. 20 minutes from the station) there is an observation tower, refreshments. The educational path called "The Knights path - Rytířská stezka - Ścieżka rycerska" will inform you about history and interesting facts about Velká Čantoryje. by car: from Jablunkov over the border crossing Bukovec/Jasnowice continue through Istebna, Kubalonka gap, Wisla to Ustroń. At the beginning of the town, on the left, (marked by information board) there is lower station of the chair lift. by car: from Třinec over the border crossing Horní Líštná/Leszna Górna continue through Dzięgielow to Ustroń. At the end of the town, on the right there is lower station of the chair lift.